For over a decade, the failure to reproduce findings in several disciplines, including the biomedical, behavioral, and social sciences, have led some authors to claim that there is a so-called “replication (or reproducibility) crisis” in those disciplines. The current article examines: (a) various aspects of the reproducibility of scientific studies, including definitions of reproducibility; (b) published concerns about reproducibility in the scientific literature and public press; (c) variables involved in assessing the success of attempts to reproduce a study; (d) suggested factors responsible for reproducibility failures; (e) types of validity of experimental studies and threats to validity as they relate to reproducibility; and (f) evidence for threats to reproducibility in the behavior science/analysis literature. Suggestions for improving the reproducibility of studies in behavior science and analysis are described throughout. Branch, M. N. (2018). The “Reproducibility Crisis:” Might the Methods Used Frequently in Behavior-Analysis Research Help? Perspectives on Behavior Science. https://doi.org/10.1007/s40614-018-0158-5. Fisher, A., Anderson, G. B., Peng, R., & Leek, J. (2014). A randomized trial in a massive online open course shows people don’t know what a statistically significant relationship looks like, but they can learn. PeerJ, 2, e589. https://doi.org/10.7717/peerj.589. Hales, A. H., Wesselmann, E. D., & Hilgard, J. (2018). Improving psychological science through transparency and openness: An overview. 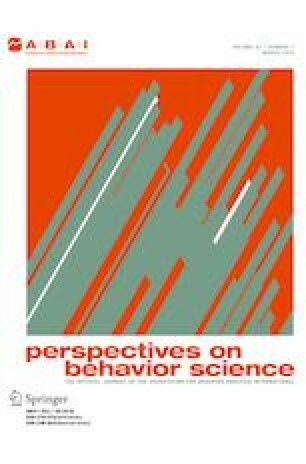 Perspectives on Behavior Science, 1–19. https://doi.org/10.1007/s40614-018-00186-8. Killeen, P. R. (2018). Predict, control, and replicate to understand: How statistics can foster the fundamental goals of science. Perspectives on Behavior Science. https://doi.org/10.1007/s40614-018-0171-8. Kratochwill, T. R., Hitchcock, J., Horner, R. H., Levin, J. R., Odom, S. L., Rindskopf, D. M & Shadish, W. R. (2010). Single-case designs technical documentation. Retrieved from what works clearing house website: http://ies.ed.gov/ncee/wwc/pdf/wwc_scd.pdf. Kyonka, E. G. (2018). Tutorial: small-N power analysis. Perspectives on Behavior Science. https://doi.org/10.1007/s40614-018-0167-4. Lanovaz, M. J., Turgeon, S., Cardinal, P., & Wheatley, T. L. (2018). Using single-case designs in practical settings: Is within-subject replication always necessary? Perspectives on Behavior Science, 1–10. https://doi.org/10.1007/s40614-018-0138-9. Perone, M. (2018). How I learned to stop worrying and love replication failures. Perspectives on Behavior Science. https://doi.org/10.1007/s40614-018-0153-x. Weaver, E. S., & Lloyd, B. P. (2018). Randomization tests for single case designs with rapidly alternating conditions: An analysis of p-values from published experiments. Perspectives on Behavior Science, https://doi.org/10.1007/s40614-018-0165-6.